Ireland U17s were beaten in controversial circumstances in the quarter-finals of the European Championships this evening. 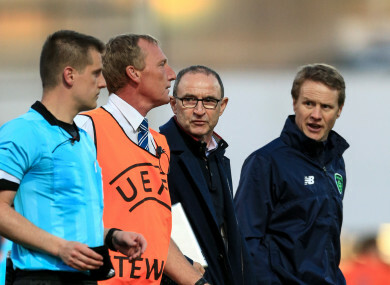 Republic of Ireland senior manager Martin O'Neill and Under 17 manager Colin O'Brien speak with referee Zbynek Proske after the match. IRELAND U17S BOSS Colin O’Brien was in a reflective mood after seeing his side lose out to the Netherlands in controversial circumstances during the European Championship quarter-finals in Chesterfield this evening. A shootout defeat saw Irish goalkeeper Jimmy Corcoran save the final spot kick, before being sent off for encroaching, with the resulting re-take seeing the Netherlands book their place in the competition’s semi-finals. Yet despite both senior boss Martin O’Neill and O’Brien expressing their dissatisfaction to officials afterwards, the former Cork City player was calm when speaking to RTÉ. “I think he said something that he might have come off his line earlier and he warned the Dutch goalkeeper in two of the penalties as well,” O’Brien said, before paying tribute to his side. “Look, these boys have done their country proud tonight. They’ve great character, they’ve been like that all year and they’re a super bunch of lads. “Probably our quality on the ball tonight might have been a little bit better, but we limited this talented Dutch team in goal-scoring opportunities. “We got a great goal after going one down, it went to penalties and we were very unfortunate with what happened here tonight. “They’ll be devastated, but they’ve been fantastic all year and they’ve all got big careers ahead of them. Email “'He warned the Dutch goalkeeper in two of the penalties as well'”. Feedback on “'He warned the Dutch goalkeeper in two of the penalties as well'”.